AT&T plans to launch its first 4G phone on February 13, the HTC Inspire 4G. The Inspire 4G is also the first AT&T phone to run Android 2.2 and AT&T Mobile Hotspot. There are some nice specs packed into this phone including a 8-megapixel camera, a 4.3-inch super LCD display, a 1GHz processor, and HTC Sense. Don’t forget… there are more than 20 different 4G phones AT&T plans to introduce in 2011. The HTC Inspire 4G will be available in AT&T stores for $99.99 with a two-year contract. Check out the press release after the jump. AT&T* will begin selling the HTC Inspire™ 4G on Feb. 13. The first 4G mobile phone offered by AT&T, the HTC Inspire 4G is the first to run the Android 2.2 platform and AT&T Mobile Hotspot application. The 4.3-inch super LCD display on the HTC Inspire 4G will be the largest in the AT&T portfolio, and the first to offer the next-generation HTC Sense experience. HTC Inspire 4G will cost $99.99 after a two-year agreement beginning Feb. 13 in company owned retail stores and online at http://www.wireless.att.com/. AT&T is the leader in smartphones and expects to widen that lead in 2011. In January, AT&Tcommitted to an industry-leading Android portfolio in the U.S. in 2011 and said it plans to offer two 4G smartphones in the first quarter. The HTC Inspire 4G is the first of more than 20 4G devices AT&T plans to deliver in 2011. AT&T has completed the deployment of HSPA+ to virtually 100 percent of its mobile broadband network, which enables 4G speeds when combined with Ethernet or fiber backhaul. The HTC Inspire™4G will be the first 4G smartphone in AT&T stores and will have the largest screen of any AT&T smartphone, with a 4.3-inch super LCD display, and will offer an 8-megapixel camera with HD video recording. Running on the Android 2.2 platform, the HTC Inspire 4G will be the first smartphone in the U.S. to feature the next-generation HTC Sense™ experience with cloud services. The HTC Inspire 4G will also be the first to introduce AT&T Mobile Hotspot service built into the smartphone, allowing users to connect additional Wi-Fi-enabled devices. 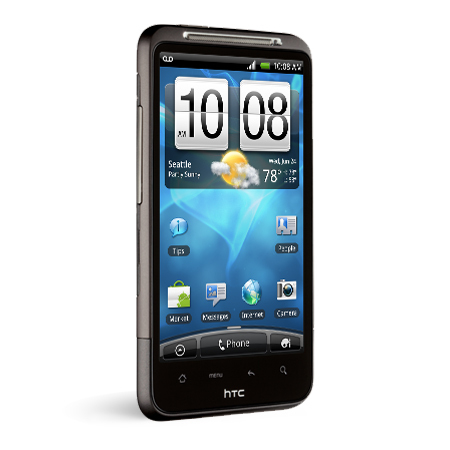 Exclusively available to AT&T customers for $99.99 after a two-year agreement, the HTC Inspire 4G will include a 1 GHz processor, Dolby® Mobile and SRS WOW HD sound, and a premium, aluminum unibody design. HTC Inspire 4G comes preloaded with a Blockbuster and eReader application to keep users entertained on the go. For more information, visitwww.att.com/inspire4G. With the next-generation of HTC Sense, the HTC Inspire 4G offers even more ways to stay connected, including FriendStream™, which delivers Facebook, Twitter and Flickr updates in a consolidated view. The HTC Inspire 4G also offers customers the ability to pinpoint the location of a lost phone on a map and send a command to make the phone sound an alert – even while on “silent” mode – through the htcsense.com website. If needed, owners can also remotely wipe all of the phone’s data with a single command in addition to forwarding calls and text messages to a different number. ”With a 4.3 inch screen, latest version of the HTC Sense experience and a sleek unibody aluminum design, the HTC Inspire 4G is the first true superphone to launch at under $100, bringing unparalleled power to more people than ever before,” said Jason Mackenzie, president of HTC Americas. 1: Mobile broadband coverage is not available in all areas. 4G speeds delivered by HSPA+ with enhanced backhaul. Will be available in limited areas. Availability increasing with ongoing backhaul deployment. Learn more at att.com/network. 2: Limited time offer. Two-year contract required. Qualified customers only. Early Termination Fee up to $325. HTC Inspire 4G requires a minimum data service starting at $15/mo. 3: Mobile Hotspots requires a DataPro Tethering Plan. Devices connected to your Mobile Hotspot use data from your DataPro Tethering Plan. DataPro Tethering Plans are not unlimited and significant charges may be incurred if the included data allowance is exceeded. Performance may vary depending on the number of devices connected and other factors.